Chimney Mountain 4, our largest Chimney cabin, is now available! A few photos taken, but more to follow . . . 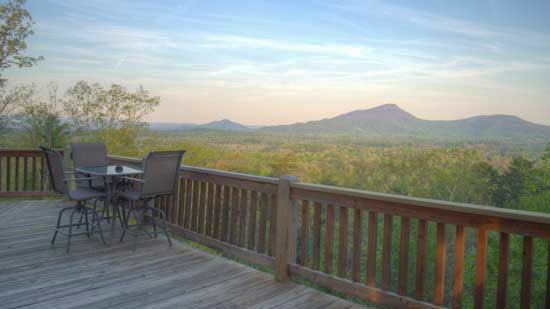 Welcome to Chimney Mountain Cabins, just outside Helen GA north of Anna Ruby Falls on Unicoi Highway! Here are five unique rustic with elegance 2-bedroom cabins with fireplaces newly renovated. Chimney Mountain Cabin 4 is the largest of the group, and has a spacious lower level, perfect for families to enjoy a true mountain getaway experience. The spiral staircase in the dining/kitchen area leads down to the large open lower level with additional sleeping, dining, and a great place to gather. Situated on the borders of the National Forest providing walking/hiking trails just outside your cabin that lead to Snake Branch Creek, a favorite for our guests, especially the pups! Select all 5 for that group gathering that easily accommodates over 23 guests* combined. Video of nearby Old Chimney Mtn/Tray Mtn Rd where you can take your 4x4 or dirt bike of your choice off roading! A valid vehicle tag is all that's required!